January is Thyroid Awareness Month, and according to the American Thyroid Association, nearly 60 million Americans, mostly women, have some type of thyroid problem. Dr. Elizabeth Pearce, president of the American Thyroid Association, says hypothyroidism is the most common disorder, which means the thyroid – a gland located at the bottom of the neck – produces too few hormones. And thyroid disorders particularly affect women as they age. A blood test measuring TSH levels determines whether a person has a thyroid disorder. According to Pearce, hypothyroidism affects 1 percent of the population enough to need thyroid supplements, and another 5 to 10 percent at a sub-clinical level, many of whom don’t need medication. Pearce notes that thyroid cancer also is on the rise, but it’s usually treatable. 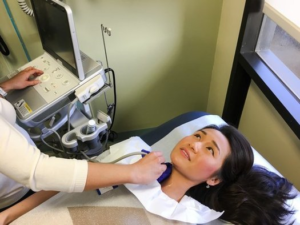 “About 54,000 adults diagnosed with thyroid cancer in the U.S. in 2018, which means about 1 percent of individuals in the U.S. will be diagnosed with thyroid cancer in their lifetimes, based on current numbers,” she points out. Pearce adds one-half of 1 percent of Americans suffer from hyperthyroidism, which means the thyroid gland produces too many hormones. Pearce says the reasons for thyroid disorders in the U.S. are not well understood. One cause around the world is iodine deficiency, but that hasn’t been a problem in the U.S. for about a century. However, she says one important group has become more iodine deficient in the last 10 years: pregnant women. “Specifically for women who are planning pregnancy, or who are pregnant, or who are breastfeeding, the current recommendations are that those women should be taking a daily supplement containing 150 micrograms of iodine to make sure they’re getting what they need,” she states. Some prenatal vitamins have iodine, but some don’t. Pearce also suggests this supplement because iodine deficiency is associated with lower IQ in fetal development. Thankfully, most thyroid disorders are easily treated with supplements. More information about thyroid disease is online at thyroid.org.